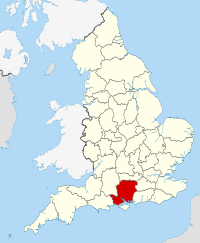 Hampshire (/ˈhæmpʃər/, /-ʃɪər/ ( listen); abbreviated Hants)[a] is a county on the southern coast of England. The county town is the city of Winchester. Its two largest cities, Southampton and Portsmouth, are administered separately as unitary authorities; the rest of the county is governed by Hampshire County Council. Agriculture had arrived in southern Britain by 4000 BCE, and with it a neolithic culture. Some deforestation took place at that time, although during the Bronze Age, beginning in 2200 BCE, this became more widespread and systematic. Hampshire has few monuments to show from these early periods, although nearby Stonehenge was built in several phases at some time between 3100 and 2200 BCE. 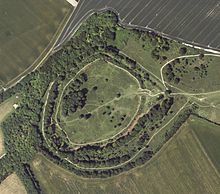 In the very late Bronze Age, fortified hilltop settlements known as hillforts began to appear in large numbers in many parts of Britain including Hampshire, and these became more and more important in the early and middle Iron Age; many of these are still visible in the landscape today and can be visited, notably Danebury Rings, the subject of a major study by archaeologist Barry Cunliffe. By this period, the people of Britain predominantly spoke a Celtic language, and their culture shared much in common with the Celts described by classical writers. Hillforts largely declined in importance in the second half of the second century BCE, with many being abandoned. Probably around this period, the first recorded invasion of Britain took place, as southern Britain was largely conquered by warrior-elites from Belgic tribes of northeastern Gaul - whether these two events are linked to the decline of hillforts is unknown. By the Roman conquest, the oppidum at Venta Belgarum, modern-day Winchester, was the de facto regional administrative centre; Winchester was, however, of secondary importance to the Roman-style town of Calleva Atrebatum, modern Silchester, built further north by a dominant Belgic polity known as the Atrebates in the 50s BCE. Julius Caesar invaded southeastern England briefly in 55 and again in 54 BCE, but he never reached Hampshire. Notable sites from this period include Hengistbury Head (now in Dorset), which was a major port. The Romans invaded Britain again in 43 CE, and Hampshire was incorporated into the Roman province of Britannia very quickly. It is generally believed their political leaders allowed themselves to be incorporated peacefully. Venta became the capital of the administrative polity of the Belgae, which included most of Hampshire and Wiltshire and reached as far as Bath. Whether the people of Hampshire played any role in Boudicca's rebellion of 60-61 CE is not recorded, but evidence of burning is seen in Winchester dated to around this period. For most of the next three centuries, southern Britain enjoyed relative peace. The later part of the Roman period had most towns build defensive walls; a pottery industry based in the New Forest exported items widely across southern Britain. A fortification near Southampton was called Clausentum, part of the Saxon Shore forts, traditionally seen as defences against maritime raids by Germanic tribes. The Romans withdrew from Britain in 410 CE. Two major Roman roads, Ermin Way and Port Way cross the north of the country connecting Calleva Atrebatum with Corinium Dobunnorum, modern Cirencester, and Old Sarum respectively. Other roads connected Venta Belgarum with Old Sarum, Wickham and Clausentum. A road, presumed to diverge from the Chichester to Silchester Way at Wickham, connected Noviomagus Reginorum, modern Chichester, with Clausentum. Records are unreliable for the next 200 years, but in this time, southern Britain went from being Brythonic to being English and Hampshire emerged as the centre of what was to become the most powerful kingdom in Britain, the Kingdom of Wessex. Evidence of early Anglo-Saxon settlement has been found at Clausentum, dated to the fifth century. By the seventh century, the population of Hampshire was predominantly English-speaking; around this period, the administrative region of "Hampshire" seems to appear; the name is attested as "Hamtunscir" in 755, and Albany Major suggested that the traditional western and northern borders of Hampshire may even go back to the very earliest conquests of Cerdic, legendary founder of Wessex, at the beginning of the sixth century. Wessex, with its capital at Winchester, gradually expanded westwards into Brythonic Dorset and Somerset in the seventh century. A statue in Winchester celebrates the powerful King Alfred, who repulsed the Vikings and stabilised the region in the 9th century. A scholar as well as a soldier, the Anglo-Saxon Chronicle, a powerful tool in the development of the English identity, was commissioned in his reign. King Alfred proclaimed himself "King of England" in 886; but Athelstan of Wessex did not officially control the whole of England until 927. By the Norman conquest, London had overtaken Winchester as the largest city in England and after the Norman Conquest, King William I made London his capital. While the centre of political power moved away from Hampshire, Winchester remained an important city; the proximity of the New Forest to Winchester made it a prized royal hunting forest; King William Rufus was killed while hunting there in 1100. The county was recorded in the Domesday Book divided into 44 hundreds. From the 12th century, the ports grew in importance, fuelled by trade with the continent, wool and cloth manufacture in the county, and the fishing industry, and a shipbuilding industry was established. By 1523 at the latest, the population of Southampton had outstripped that of Winchester. Over several centuries, a series of castles and forts was constructed along the coast of the Solent to defend the harbours at Southampton and Portsmouth. These include the Roman Portchester Castle which overlooks Portsmouth Harbour, and a series of forts built by Henry VIII including Hurst Castle, situated on a sand spit at the mouth of the Solent, Calshot Castle on another spit at the mouth of Southampton Water, and Netley Castle. Southampton and Portsmouth remained important harbours when rivals, such as Poole and Bristol, declined, as they are amongst the few locations that combine shelter with deep water. Mayflower and Speedwell set sail for America from Southampton in 1620. During the English Civil War (1642-1651) there were several skirmishes in Hampshire between the Royalist and Parliamentarian forces. Principal engagements were the Siege of Basing House between 1643 and 1645, and the Battle of Cheriton in 1644; both were significant Parliamentarian victories. Other clashes included the Battle of Alton in 1643, where the commander of the Royalist forces was killed in the pulpit of the parish church, and the Siege of Portsmouth in 1642. By the mid-19th century, with the county's population at 219,210 (double that at the beginning of the century) in more than 86,000 dwellings, agriculture was the principal industry (10 per cent of the county was still forest) with cereals, peas, hops, honey, sheep and hogs important. Due to Hampshire's long association with pigs and boars, natives of the county have been known as Hampshire hogs since the 18th century. In the eastern part of the county the principal port was Portsmouth (with its naval base, population 95,000), while several ports (including Southampton, with its steam docks, population 47,000) in the western part were significant. In 1868, the number of people employed in manufacture exceeded those in agriculture, engaged in silk, paper, sugar and lace industries, ship building and salt works. Coastal towns engaged in fishing and exporting agricultural produce. Several places were popular for seasonal sea bathing. The ports employed large numbers of workers, both land-based and seagoing; Titanic, lost on her maiden voyage in 1912, was crewed largely by residents of Southampton. On 16 October 1908, Samuel Franklin Cody made the first powered flight of 400 yd (370 m) in the United Kingdom at Farnborough, then home to the Army Balloon Factory. Hampshire played a crucial role in both World Wars due to the large Royal Navy naval base at Portsmouth, the army camp at Aldershot, and the military Netley Hospital on Southampton Water, as well as its proximity to the army training ranges on Salisbury Plain and the Isle of Purbeck. Supermarine, the designers of the Spitfire and other military aircraft, were based in Southampton, which led to severe bombing of the city in World War 2. Aldershot remains one of the British Army's main permanent camps. Farnborough is a major centre for the aviation industry. Although the Isle of Wight has at times been part of Hampshire, it has been administratively independent for over a century, obtaining a county council of its own in 1890. The Isle of Wight became a full ceremonial county in 1974. Apart from a shared police force, no formal administrative links now exist between the Isle of Wight and Hampshire, though many organisations still combine Hampshire and the Isle of Wight. In the 20th century, local government reorganisation led to a reduction in Hampshire's size; in 1974, the towns of Bournemouth and Christchurch were transferred to Dorset. Hampshire is bordered by Dorset to the west, Wiltshire to the north-west, Berkshire to the north, Surrey to the north-east, and West Sussex to the east. The southern boundary is the coastline of the English Channel and the Solent, facing the Isle of Wight. It is the largest county in South East England and remains the third largest shire county in the United Kingdom despite losing more land than any other English county in all contemporary boundary changes. At its greatest size in 1890, Hampshire was the fifth-largest county in England. It now has an overall area of 3,700 km2 (1,400 sq mi), and measures about 86 km (53 mi) east–west and 76 km (47 mi) north–south. A 2014 study found that Hampshire shares significant reserves of shale oil with other neighbouring counties, totalling 4.4 billion barrels of oil, which then Business and Energy Minister Michael Fallon said "will bring jobs and business opportunities" and significantly help with UK energy self-sufficiency. Fracking in the area is required to achieve these objectives, which has been opposed by environmental groups. Hampshire contains all its green belt in the New Forest district, in the southwest of the county, from the boundary with Dorset along the coastline to Lymington and northwards to Ringwood. Its boundary is contiguous with the New Forest National Park. The Hampshire portion was first created in 1958. Its function is to control expansion in the South East Dorset conurbation and outlying towns and villages. The highest point in Hampshire is Pilot Hill at 286 metres (938 ft), in the northwest corner of the county, bordering Berkshire, and there are some 20 other hills exceeding 200 metres (660 ft). Butser Hill, at 271 metres (889 ft), where the A3 crosses the South Downs, is probably the best known. In the north and centre of the county the substrate is the rocks of the Chalk Group, which form the Hampshire Downs and the South Downs. These are high hills with steep slopes where they border the clays to the south. The hills dip steeply forming a scarp onto the Thames valley to the north, and dip gently to the south. The highest village in Hampshire at about 240 metres (790 ft) above sea level is Ashmansworth, located between Andover and Newbury. The Itchen and Test are trout rivers that flow from the chalk through wooded valleys into Southampton Water. Other important watercourses are the Hamble, Meon, Beaulieu and Lymington rivers. The Hampshire Avon, which links Stonehenge to the sea, passes through Fordingbridge and Ringwood and then forms the modern border between Hampshire and Dorset. The northern branch of the River Wey has its source near Alton and flows east past Bentley. The River Loddon rises at West Ham Farm and flows north through Basingstoke. Hampshire's downland supports a calcareous grassland habitat, important for wild flowers and insects. A large area of the downs is now protected from further agricultural damage by the East Hampshire Area of Outstanding Natural Beauty. The River Test has a growing number of otters as, increasingly, does the Itchen, although other areas of the county have quite low numbers. There are wild boar kept for meat in the New Forest, which is known for its ponies and herds of fallow deer, red deer, roe deer, and sika deer as well as a small number of muntjac deer. The deer had been hunted for some 900 years until 1997. An unwelcome relative newcomer is the mink population, descended from animals that escaped or were deliberately released from fur farms since the 1950s, which cause havoc amongst native wildlife. Farlington Marshes, 125 hectares (310 acres) of flower-rich grazing marsh and saline lagoon at the north end of Langstone Harbour, is a nature reserve and an internationally important over-wintering site for wildfowl. In a valley on the downs is Selborne; the countryside surrounding the village was the location of Gilbert White's pioneering observations on natural history. Hampshire's county flower is the Dog Rose. At the 2001 census the ceremonial county recorded a population of 1,644,249, of which 1,240,103 were in the administrative county, 217,445 were in the unitary authority of Southampton, and 186,701 were in Portsmouth. The population of the administrative county grew 5.6 per cent from the 1991 census and Southampton grew 6.2 per cent (Portsmouth remained unchanged), compared with 2.6 per cent for England and Wales as a whole. Eastleigh and Winchester grew fastest at 9 per cent each. Southampton and Portsmouth are the main settlements within the South Hampshire conurbation, which is home to about half of the ceremonial county's population. 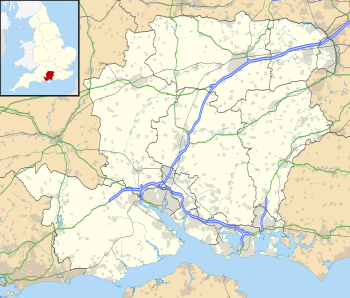 The larger South Hampshire metropolitan area has a population of 1,547,000. The table below shows the population change up to the 2011 census, contrasting the previous census. It also shows the proportion of residents in each district reliant upon lowest income and/or joblessness benefits, the national average proportion of which was 4.5 per cent (August 2012). The most populous district of Hampshire is New Forest District. At the 2011 census, about 89 per cent of residents were white British, falling to 85.87 per cent in Southampton. The significant ethnic minorities were Asian at 2.6 per cent and mixed race at 1.4 per cent; 10 per cent of residents were born outside the UK. 59.7 per cent stated their religion as Christian and 29.5 per cent as not religious. Significant minority religions were Islam (1.46 per cent) and Hinduism (0.73 per cent). The Church of England Diocese of Winchester was founded in 676AD and covers about two thirds of Hampshire and extends into Dorset. Smaller parts of Hampshire are covered by the dioceses of Portsmouth, Guildford and Oxford. The Roman Catholic Diocese of Portsmouth covers Hampshire as well as the Isle of Wight and the Channel Islands. With the exceptions of the unitary authorities of Portsmouth and Southampton, Hampshire is governed by Hampshire County Council based at Castle Hill in Winchester, with eleven non-metropolitan districts beneath it and, for the majority of the county, parish councils or town councils at the local level. Hampshire contains two national parks; the New Forest is wholly within the county, and the South Downs National Park embraces parts of Hampshire, West Sussex and East Sussex; they are each overseen by a national park authority. Hampshire is divided into 18 parliamentary constituencies. At the 2017 General Election, the Conservatives captured 16 seats, continuing their dominance in the county. Labour took two seats, Southampton Test and Portsmouth South. In the 2015 general election, every Hampshire seat except Southampton Test (Labour) was won by the Conservatives. In 2010, 14 constituencies were represented by Conservative Members of Parliament (MPs), two by the Liberal Democrats, and two by Labour. Labour represented the largest urban centre, holding both Southampton constituencies (Test and Itchen). The Liberal Democrats held Portsmouth South and Eastleigh. At the 2013 local elections for Hampshire County Council, the Conservative Party had a 37.51 per cent share of the votes, the Liberal Democrats 21.71 per cent, the UK Independence Party 24.61 per cent and Labour 10 per cent. As a result, 45 Conservatives, 17 Liberal Democrats, 10 UKIP, four Labour and one Community Campaign councillor sit on the County Council. Southampton City Council, which is a separate Unitary Authority, has 28 Labour, 16 Conservative, 2 Councillors Against the Cuts and 2 Liberal Democrat councillors. Portsmouth City Council, also a UA, has 25 Liberal Democrat, 12 Conservative and 5 Labour councillors. Hampshire has its own County Youth Council (HCYC) and is an independent youth-run organisation. It meets once a month around Hampshire and aims to give the young people of Hampshire a voice. It also has numerous district and borough youth councils including Basingstoke's "Basingstoke & Deane Youth Council". Hampshire is one of the most affluent counties in the country, with a gross domestic product (GDP) of £29 billion, excluding Southampton and Portsmouth. In 2018, Hampshire had a GDP per capita of £22,100, comparable with the UK as a whole. Portsmouth and Winchester have the highest job densities in the county; 38 per cent of workplace workers in Portsmouth commuted into the city in 2011. Southampton has the highest number of total jobs and commuting both into and out of the city is high. The county has a lower level of unemployment than the national average, at 1.3 per cent when the national rate is 2.1 per cent, as of February 2018. About one third are employed by large firms. Hampshire has a considerably higher than national average employment in high-tech industries, but average levels in knowledge-based industry. About 25 per cent of the population work in the public sector. Tourism accounts for some 60,000 jobs in the county, around 9 per cent of the total. One of the principal companies in the high tech sector is IBM which has its research and development laboratories at Hursley and its UK headquarters at Cosham. Many rural areas of Hampshire have traditionally been reliant on agriculture, particularly dairy farming, although the significance of agriculture as a rural employer and rural wealth creator has declined since the first half of the 20th century and agriculture currently employs 1.32 per cent of the rural population. The extractive industries deal principally with sand, gravel, clay and hydrocarbons. There are three active oilfields in Hampshire with one being also used as a natural gas store. These are in the west of the county in the Wessex Basin. The Weald Basin to the east has potential as a source of shale oil but is not currently exploited. The New Forest area is a national park, and tourism is a significant economic segment in this area, with 7.5 million visitors in 1992. The South Downs and the cities of Portsmouth, Southampton, and Winchester also attract tourists to the county. Southampton Boat Show is one of the biggest annual events held in the county, and attracts visitors from throughout the country. In 2003, the county had a total of 31 million day visits, and 4.2 million longer stays. The cities of Southampton and Portsmouth are both significant ports, with Southampton docks handling a large proportion of the national container freight traffic as well as being a major base for cruise liners, and Portsmouth Harbour accommodating one of the Royal Navy's main bases and a terminal for cross-channel ferries to France and Spain. The docks have traditionally been large employers in these cities, though mechanisation of cargo handling has led to a reduction in manpower needed. The Marine Accident Investigation Branch has its principal offices in Southampton, while the Air Accidents Investigation Branch has its head office in Farnborough. The Rail Accident Investigation Branch has one of its two offices at Farnborough. Southampton Airport, with an accompanying main line railway station, is an international airport situated in the Borough of Eastleigh, close to Swaythling in the city of Southampton. The Farnborough International Airshow is a week-long event that combines a major trade exhibition for the aerospace and defence industries with a public airshow. The event is held in mid-July in even-numbered years at Farnborough Airport. The first five days (Monday to Friday) are dedicated to trade, with the final two days open to the public. Cross-channel and cross-Solent ferries from Southampton, Portsmouth and Lymington link the county to the Isle of Wight, the Channel Islands and continental Europe. The South Western Main Line (operated by South Western Railway) from London to Weymouth runs through Winchester and Southampton, and the Wessex Main Line from Bristol to Portsmouth also runs through the county as does the Portsmouth Direct Line. 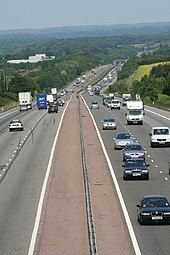 The M3 motorway bisects the county from the southwest, at the edge of the New Forest near Southampton, to the northeast on its way to connect with the M25 London orbital motorway. At its southern end it links with the M27 south coast motorway. The construction of the Twyford Down cutting near Winchester caused major controversy by cutting through a series of ancient trackways and other features of archaeological significance. The M27 serves as a bypass for the major conurbations and as a link to other settlements on the south coast. Other important roads include the A27, A3, A31, A34, A36 and A303. The county has a high level of car ownership, with only 15.7 per cent having no access to a private car compared with 26.8 per cent for England and Wales. The county has a lower than average use of trains (3.2 compared with 4.1 per cent for commuting) and buses (3.2 to 7.4 per cent), but a higher than average use of bicycles (3.5 to 2.7 per cent) and cars (63.5 to 55.3 per cent). The school system in Hampshire (including Southampton and Portsmouth) is comprehensive. Geographically inside the Hampshire LEA are 24 independent schools, Southampton has three and Portsmouth has four. Few Hampshire schools have sixth forms, which varies by district council. There are 14 further education colleges within the Hampshire LEA, including six graded as 'outstanding' by Ofsted: Alton College, Brockenhurst College, Farnborough College of Technology, Farnborough Sixth Form College, Peter Symonds College, Queen Mary's College, and South Downs College. The four universities are the University of Southampton, Southampton Solent University, the University of Portsmouth, and the University of Winchester (which also had a small campus in Basingstoke until 2011). Farnborough College of Technology awards University of Surrey-accredited degrees. There are major NHS hospitals in each of the cities, and smaller hospitals in several towns, as well as a number of private hospitals. Southern Health NHS Foundation Trust coordinates public health services, while Hampshire Hospitals NHS Foundation Trust coordinates hospital services. There are a number of local museums, such as the City Museum in Winchester, which covers the Iron Age and Roman periods, the Middle Ages, and the Victorian period over three floors. A "Museum of the Iron Age" is in Andover. Southampton's Sea City Museum is primarily focused on the City's links with the Titanic. Basingstoke's Milestones Museum records the County's industrial heritage. There are also a number of national museums in Hampshire. The National Motor Museum is located in the New Forest at Beaulieu. The Royal Navy Museum is part of Portsmouth Historic Dockyard. Other military museums include The Submarine Museum at Gosport, the Royal Marines Museum, originally in Southsea but due to transfer to the Dockyard in 2019, the Aldershot Military Museum, the D-Day Story by Southsea Castle and the Museum of Army Flying at Middle Wallop. Several museums and historic buildings in Hampshire are the responsibility of the Hampshire Cultural Trust. Specialist museums include the Gilbert White museum in his old home in Selborne, which also includes The Oates Collection, dedicated to the explorer Lawrence Oates. The New Forest and Hampshire County Show takes place annually at the end of July; 2018 marks its 98th year. The largest gathering of Muslims in Western Europe, Jalsa Salana, takes place near Alton, with 37,000 visitors in 2017. The ancient festival of Beltain takes place at Butser Ancient Farm in the spring. There are 187 Grade I listed buildings in the county, ranging from statues to farm buildings and churches to castles, 511 buildings listed Grade II*, and many more listed in the Grade II category. National Heritage's figures include the Isle of Wight, listing 208 Grade I buildings, 578 Grade II* and 10,372 Grade II, 731 scheduled monuments, two wrecks, 91 parks and gardens, and a battlefield: the Battle of Cheriton, which took place in 1644, near Winchester. The game of cricket was largely developed in south-east England, with one of the first teams forming at Hambledon in 1750, with the Hambledon Club creating many of cricket's early rules. Hampshire County Cricket Club is a first-class team. The main county ground is the Rose Bowl in West End, which has hosted one day internationals and which, following redevelopment, hosted its first test match in 2011. Hampshire's relatively safe waters have allowed the county to develop as one of the busiest sailing areas in the country, with many yacht clubs and several manufacturers on the Solent. The Hamble, Beaulieu and Lymington rivers are major centres for both competitive and recreational sailing, along with Hythe and Ocean Village marinas. The sport of windsurfing was invented at Hayling Island in the south east of the county. Hampshire has several association football teams, including Premier league side Southampton F.C., EFL League One side Portsmouth F.C. and National league sides Aldershot Town F.C., Eastleigh F.C. and Havant & Waterlooville F.C.. Portsmouth F.C. and Southampton F.C. have traditionally been fierce rivals. Portsmouth won the FA Cup in 1939 and 2008 and the Football League title in 1949 and 1950. Southampton won the FA Cup in 1976 and reached the finals in 1900, 1902, and 2003. Aldershot F.C. were members of the Football League from 1932 to 1992. They were succeeded by Aldershot Town F.C. who in 2008 were crowned the Conference Premier champions and promoted to the Football League, but lost their Football League status after the 2012–13 season. Hampshire has a number of Non League football teams. Bashley, Gosport borough and AFC Totton play in the Southern Football League Premier Division and Sholing F.C. and Winchester City F.C. play in the Southern Football League Division One South and West. Thruxton Circuit, in the north of the county, is Hampshire's premier motor racing circuit, with a karting circuit; there are other karting circuits at Southampton and Gosport. The other main circuit is the Ringwood Raceway at Matchams. Lasham Airfield, near Alton, is a major centre for gliding, hosting both regional and national annual competitions. The county's television news is covered by BBC South Today from its studios in Southampton and ITV Meridian from a studio in Whiteley, though both BBC London and ITV London can be received in northern and eastern parts of the county. A local independent television station, That's Hampshire, started transmitting in May 2017. Around 25 commercial radio stations cover the area, and BBC Radio Solent looks after the majority of the county, while BBC Surrey can be heard in the north east. University journalism students also "broadcast" bulletins on line for local areas, such as the University of Winchester's WINOL (Winchester News Online), run by students on its BA (Hons) Journalism course. Southampton and Portsmouth support daily newspapers; the Southern Daily Echo and The News respectively. The Basingstoke Gazette is published three times a week, and there are a number of other papers that publish on a weekly basis, notably the Hampshire Chronicle, one of the oldest newspapers in the country. Possibly the most notable resident was the Duke of Wellington, who lived at Stratfield Saye House in the north of the county from 1817. Hampshire's literary connections include the birthplace of authors Jane Austen, Wilbert Awdry and Charles Dickens, and the residence of others, such as Charles Kingsley and Mrs Gaskell. Austen lived most of her life in Hampshire, where her father was rector of Steventon, and wrote all of her novels in the county. Hampshire also has many visual art connections, claiming the painter John Everett Millais as a native, and the cities and countryside have been the subject of paintings by L. S. Lowry and J. M. W. Turner. Selborne was the home of Gilbert White. Journalist and social critic Christopher Hitchens was born into a naval family in Portsmouth. Broadcasters Philippa Forrester, Amanda Lamb and Scott Mills also are from the county. American actor and gameshow host, Richard Dawson, was born and raised here. ^ "About Hampshire". Hampshire County Council. Archived from the original on 4 March 2012. Retrieved 3 April 2012. ^ "County of Hants (Southampton)". Census of England and Wales: 1891: Area, Houses and Population: Volume 1. Her Majesty's Stationery Office. p. 121. Archived from the original on 15 May 2013. Retrieved 27 August 2012. ^ "Local Government Act 1959: Section 59: Change of Name of County". The London Gazette. 20 February 1959. p. 1241. Archived from the original on 7 May 2013. Retrieved 27 August 2012. ^ "Vision of Britain". Archived from the original on 24 February 2015. Retrieved 13 October 2014. ^ a b c "National Gazetteer". 1868. Archived from the original on 18 October 2014. Retrieved 13 October 2014. ^ "Origin of 'New Hampshire'". State Symbols USA. Archived from the original on 4 September 2015. Retrieved 30 August 2015. ^ "Portsmouth, New Hampshire, United States". Archived from the original on 8 October 2018. Retrieved 8 October 2018. ^ "The City of Portsmouth, Virginia: History". Archived from the original on 2 December 2017. Retrieved 7 April 2018. ^ "The British Museum: Prehistoric Britain" (PDF). p. 6. Archived (PDF) from the original on 18 February 2018. Retrieved 14 April 2018. ^ "Hampshire County Council: The Atlas of Hampshire's Archaeology" (PDF). Archived (PDF) from the original on 15 April 2018. Retrieved 14 April 2018. ^ "Bouldnor Cliff". Maritime Archaeology Trust. Archived from the original on 12 April 2018. Retrieved 11 April 2018. ^ Davies, Hugh (2002). Roads in Roman Britain. Stroud: Tempus. pp. 168–183. ISBN 0-7524-2503-X. ^ Adams, Max (2017). Ælfred's Britain. London: Head of Zeus Ltd. pp. 229–232. ISBN 9781784080303. ^ Ian Crump (29 December 2017). "A look back at when the Mayflower and Speedwell left Southampton bound for America". Southern Daily Echo. Archived from the original on 25 April 2018. Retrieved 24 April 2018. ^ Mee, Arthur (1967). The King's England - Hampshire and the Isle of Wight. London: Hodder & Stoughton. ISBN 0 340 00083 X. ^ Barratt, Nick (2009). Lost Voices From the Titanic: The Definitive Oral History. London: Random House. p. 84. ISBN 978-1-84809-151-1. ^ Army Flying. Wigginton: Edupub. pp. 4–5. ^ "map scales, handy facts, Hampshire". Geog.port.ac.uk. Archived from the original on 17 September 2011. Retrieved 28 November 2010. ^ "THE INTERTIDAL LAMELLIBRANCHS OF SOUTHAMPTON WATER, WITH PARTICULAR REFERENCE TO CERASTODERMA EDULE AND C. GLAUCUM – BARNES 40 (5): 413 – Journal of Molluscan Studies". Mollus.oxfordjournals.org. 4 November 2010. Archived from the original on 6 December 2013. Retrieved 28 November 2010. ^ "South East and London National Character Area map". Natural England. Archived from the original on 2 March 2012. Retrieved 17 April 2018. ^ "New Forest District Green Belt Study Final Report Prepared by LUC July 2016". 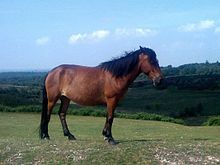 www.newforest.gov.uk. Archived from the original on 19 February 2018. Retrieved 13 April 2018. ^ Fawcett, Tony. "Green Belts: A greener future - Campaign to Protect Rural England". Archived from the original on 27 June 2018. Retrieved 13 April 2018. ^ Ordnance Survey. Streetmap/OS map showing height of Ashmansworth Archived 24 September 2015 at the Wayback Machine. ^ "The River Wey and Wey Navigations Community Site". Archived from the original on 25 June 2008. Retrieved 11 May 2018. ^ "Rivers". Wokingham District Council. Archived from the original on 28 February 2006. Retrieved 12 May 2018. ^ Welcome to Winchester City Mill. National Trust. ^ "Wild boar back in the Forest". Basingstoke Gazette. 17 May 2014. Archived from the original on 14 April 2018. Retrieved 13 April 2018. ^ "Deer". New Forest National Park Authority. Archived from the original on 15 April 2018. Retrieved 15 April 2018. ^ "Forestry Commission: New Forest Fact File" (PDF). Archived (PDF) from the original on 24 September 2015. Retrieved 8 September 2014. ^ "American Mink". Hampshire & Isle of Wight Wildlife Trust. Archived from the original on 9 April 2018. Retrieved 9 April 2018. ^ Comerford, Cathy. "Freed mink bring death to a forest". The Independent. Archived from the original on 15 April 2018. Retrieved 15 April 2018. ^ "Farlington Marshes Wildlife Reserve". Retrieved 15 April 2018. ^ "Gilbert White Museum". Archived from the original on 20 April 2018. Retrieved 15 April 2018. ^ BBC News, 5 May 2004. UK counties choose floral emblems Archived 14 March 2006 at the Wayback Machine. ^ McKie, Robin (15 October 2006). "Season of mice? How autumn lost its cool". The Guardian. The Observer. London. Archived from the original on 2 October 2013. Retrieved 2 June 2008. ^ Met Office, 2000. Annual average temperature for the United Kingdom Archived 4 March 2010 at the Wayback Machine. ^ Met Office, 2000. Annual average rainfall for the United Kingdom Archived 4 March 2010 at the Wayback Machine. ^ Met Office, 2000. Annual average sunshine for the United Kingdom Archived 4 March 2010 at the Wayback Machine. ^ "Southampton W.C Climate Period: 1981-2010". Met Office. Archived from the original on 28 July 2013. Retrieved 5 February 2013. ^ a b "Regional mapped climate averages". Met Office. November 2008. Archived from the original on 29 December 2010. Retrieved 8 March 2011. ^ "Climate Normals 1971–2000". KNMI. Archived from the original on 13 May 2012. Retrieved 3 March 2011. ^ "UK Clima Solent MRSC". Archived from the original on 2 October 2013. Retrieved 29 September 2013. ^ "Average Weather for Farnborough, ENG". June 2011. Archived from the original on 22 October 2012. Retrieved 20 September 2010. ^ "2011 Census - Built-up areas". ONS. Archived from the original on 21 September 2013. Retrieved 8 August 2013. ^ "2011 Census headline facts and figures" (PDF). Hants Gov. Archived (PDF) from the original on 13 April 2018. Retrieved 13 April 2018. ^ "Diocese of Winchester". Retrieved 17 April 2018. ^ "Portsmouth Catholic Diocese". Portsmouth Catholic Diocese. Archived from the original on 22 April 2018. Retrieved 21 April 2018. ^ Hampshire County Council, 2013. Archived 6 May 2013 at the Wayback Machine. ^ Southampton City Council, 2013. "Archived copy". Archived from the original on 28 July 2013. Retrieved 12 July 2013. CS1 maint: Archived copy as title (link). ^ Portsmouth City Council, 2013. "Archived copy". Archived from the original on 17 August 2013. Retrieved 4 November 2013. CS1 maint: Archived copy as title (link). ^ "Hampshire County Youth Council". Hcycweb.net. 22 April 2009. Archived from the original on 15 February 2009. Retrieved 3 May 2009. ^ "Basingstoke & Deane Youth Council". Bdycweb.net. Archived from the original on 23 July 2011. Retrieved 3 May 2009. ^ a b "Hampshire Key Facts & Figures" (PDF). hants.gov.uk. Archived (PDF) from the original on 14 November 2014. Retrieved 26 March 2018. ^ "Hampshire County Council: 2011 Commuter Flows" (PDF). Archived (PDF) from the original on 18 April 2018. Retrieved 17 April 2018. ^ "Economic Statistics". Hants.gov.uk. Archived from the original on 27 March 2018. Retrieved 26 March 2018. ^ "Hampshire Minerals & Waste Plan" (PDF). hants.gov.uk. Archived (PDF) from the original on 5 October 2015. Retrieved 13 April 2018. ^ New Forest District Council, n.d. "Tourism questions and answers[permanent dead link]." ^ Hampshire County Council, United Kingdom Tourism Survey & GB Leisure Day Visits Survey, 2004. "Tourism Facts and Figures Archived 10 September 2003 at the Wayback Machine." ^ "MAIB". gov.uk. Archived from the original on 21 April 2018. Retrieved 24 April 2018. ^ "Additional information." Air Accidents Investigation Branch. Retrieved on 2 May 2010. "Air Accidents Investigation Branch Farnborough House Berkshire Copse Road Aldershot Hampshire GU11 2HH"
^ "About - Rail Accident Investigation Branch - GOV.UK". Archived from the original on 7 October 2006. Retrieved 23 August 2018. ^ "Farnborough International Airshow 2018". Farnborough International Limited. 7 April 2018. Archived from the original on 22 April 2018. Retrieved 7 April 2018. ^ John Denham (2 December 1994). "Twyford Down". Hansard. Archived from the original on 27 December 2012. Retrieved 18 January 2013. ^ Hampshire County Council, 2005. Facts and Figures website Archived 6 April 2005 at the Wayback Machine. ^ "Hampshire County Council: Public Health in Hampshire". Archived from the original on 9 November 2017. Retrieved 8 April 2018. ^ "Southern Health NHS Foundation Trust". Archived from the original on 9 April 2018. Retrieved 8 April 2018. ^ "Hampshire Hospitals NHS Foundation Trust". Archived from the original on 7 April 2018. Retrieved 8 April 2018. ^ "Venues". Hampshire Cultural Trust. Archived from the original on 26 April 2018. Retrieved 25 April 2018. ^ "Hampshire County Council: Visit Hampshire: The New Forest and Hampshire County Show". Retrieved 18 April 2018. ^ "Thousands of Ahmadis meet in rural Hampshire". The Economist. 3 August 2017. Archived from the original on 15 February 2018. Retrieved 18 April 2018. ^ "Hampshire County Council: Visit Hampshire: Beltain Festival". Retrieved 18 April 2018. ^ "British Listed Buildings: Grade I Listed Buildings in Hampshire". Archived from the original on 18 April 2018. Retrieved 18 April 2018. ^ "British Listed Buildings: Grade II* Listed Buildings in Hampshire". Archived from the original on 18 April 2018. Retrieved 18 April 2018. ^ "British Listed Buildings: Listed Buildings in Hampshire". Archived from the original on 18 April 2018. Retrieved 18 April 2018. ^ "National Heritage: Hampshire". Archived from the original on 19 April 2018. Retrieved 18 April 2018. ^ BBC Online. "Southampton Old Bowling Green, Southampton, England". Archived from the original on 11 June 2009. Retrieved 6 January 2009. ^ "Windsurfing International Inc. v Tabur Marine (GB) Ltd. (1985) RPC 59". SLCC – Scots Law Courseware. The University of Strathclyde. Archived from the original on 11 December 2003. Retrieved 20 June 2010. ^ "Visit Hampshire: Driving experiences". Retrieved 22 April 2018. ^ "Lasham Gliding Society". Lasham Gliding. Archived from the original on 25 April 2018. Retrieved 24 April 2018. ^ "That's Hampshire". That's TV. Archived from the original on 13 April 2018. Retrieved 13 April 2018. ^ "ABOUT WINOL | WINOL". www.winol.co.uk. Archived from the original on 24 January 2018. Retrieved 23 January 2018. ^ "All change in the Hampshire Chronicle Newsroom". Press Gazette. 2007. Archived from the original on 7 October 2007. Retrieved 6 July 2007. ^ Hibbert, Christopher (2010). Wellington: A Personal History. HarperCollins. ISBN 978-0-00-740694-4. Retrieved 26 December 2011. Chisholm, Hugh, ed. (1911). "Hampshire" . Encyclopædia Britannica. 12 (11th ed.). Cambridge University Press. pp. 902–905. Wikivoyage has a travel guide for Hampshire.